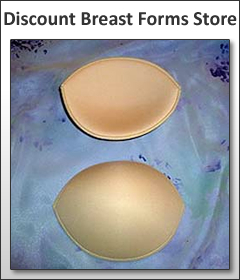 Our discount breast forms store carries so much more than just an average breast form. Woman’s Personal Health is your one stop resource for everything related to mastectomy products and more. When you are undergoing this time of pain and discomfort in your life it is good to know that you will have our handy store always there when you need products. Once you begin to see how our discount breast forms store is quick and easy you’ll return each time for your mastectomy bra needs and more. One of the best things is that we carry a large array of products from swimsuits, undergarments, hats, lymphedema sleeves, and more. There is not another woman’s health store online that will suite your needs like we can. Our website features sizing guides that will help you choose which size, type, and style of mastectomy bra will work best with your breast forms. When it comes to choosing the correct type of breast form to use with your mastectomy bra there is no need to be in the dark; always remember if you have any questions feel free to contact us before you make a purchase and we can guide you through the sizing or selection procedures. Our discount breast forms store is stocked with dozens of different sizes of breast forms so that you can get the best fit possible the first time. In addition to the mastectomy bras and forms that we keep in stock at all times there are several other categories of items such as chemotherapy hats, lymphedema sleeves for sales, and even swimwear that works great with your existing breast forms. Bookmark our discount breast forms store for all your mastectomy product needs and don’t hesitate to contact us if you have any questions regarding mastectomy products or sizing options.